"Bad Luck" Benny is a boy from the wrong side of the tracks. Recently released from jail, he has vowed to keep his head down and stay out of trouble. But he also needs to care for his ailing sister and the rest of his struggling family, and he'll do anything to make that happen--even if it means taking a position with a notorious crime boss. He soon finds himself in over his head--and worse still--falling for the one dame on earth he should be staying away from. Masie is the daughter of a wealthy gangster with the voice of an angel and gun smoke in her veins. Strong-willed but trapped in a life she never wanted, she dreams of flying free from the politics and manipulation of her father. A pawn in her family's fight for control of the city, and with a killer hot on her heels, she turns to the one person who just might be able to spring her from her gilded cage. But Masie is no angel, and her own dark secrets may come back to burn them both. 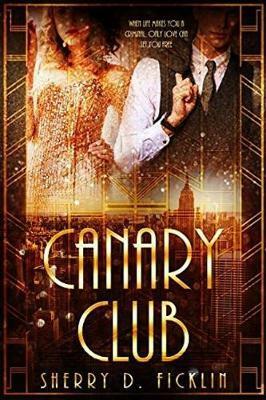 Perfect for fans of Beatriz Williams' A CERTAIN AGE or Libba Bray's THE DIVINERS, THE CANARY CLUB by Sherry D. Ficklin will entice Historical Romance fans of all ages. This Gatsby-era tale filled with dazzling speakeasies, vicious shoot-outs, gritty gangsters, and iridescent ingenues has also been compared to the television series Z: THE BEGINNING OF EVERYTHING and BOARDWALK EMPIRE.